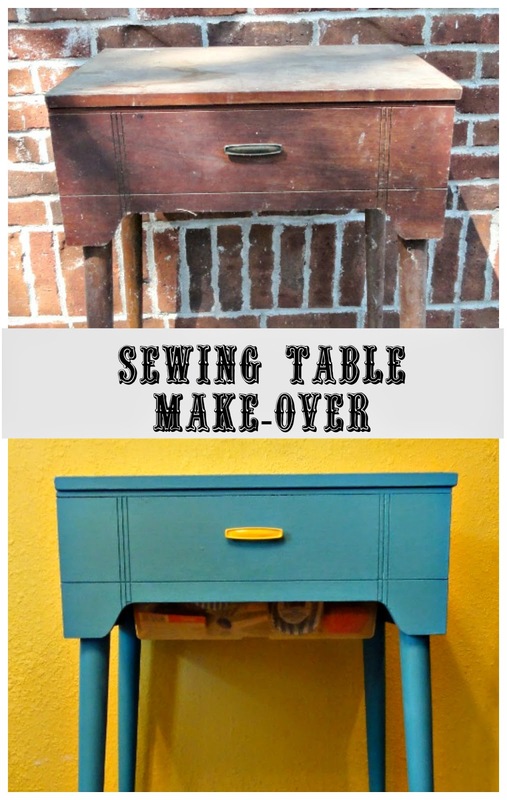 Transforming an old piece of furniture with a DIY Chalk Paint is so much fun and to be honest, rather addicting! 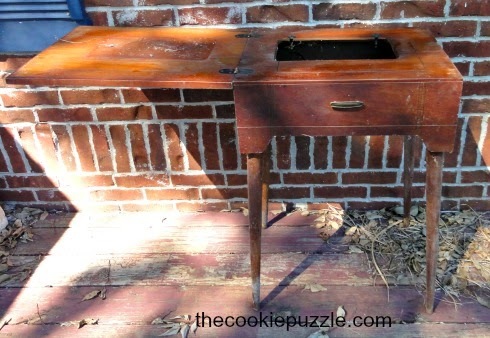 I found this old sewing table in Mr. Cookie Puzzles shed. I have no idea where it came from, or how long it has been there. As soon as I saw it, I knew I wanted it in my new Cookie/Craft Room. It was pretty nasty and dirty. I love the simple clean lines of it....I gave her a good washing, using dish soap, vinegar and water, but she still was looking pretty sad. She needed a make-over, and I knew it should be bright and fun. I have recently been using chalk paint, mostly Chalky Finish Paint by Americana Decor, I love that stuff, but I don't like that you are limited on what colors you have to choose from. I quick search on the Internet, led me to a DIY Chalk Paint "recipe" from Cookies, Crafts and Chaos. I loved that I could pick any paint color I wanted, and that it uses simple ingredients I had in the house. I would share what that ingredient is, but I feel obligated to have you go to her blog to find out. We bloggers, we have to look out for one another. So...go look...I will be right here waiting for you. Ok...did you go see? Cool, right? I love this stuff...it covers wonderfully, and mixes up fast. I will be honest, I doubt if I will EVER buy chalk paint again! So...after two coats of my DIY chalk paint and two coats of Soft Touch Varnish, her she is! The Color is called Pool Blue, and I picked it up from Michael's. The table looks amazing in the room. For the handle, I spray painted it in "Sunny Yellow" by Rustoleum. 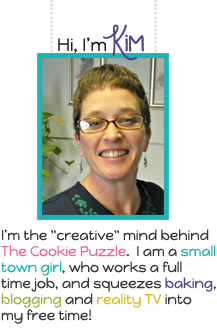 Mr. Cookie Puzzle helped me attach a plastic contain into the space that was designed to hold the sewing machine. 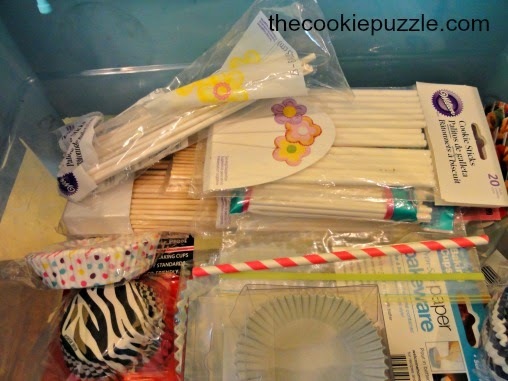 It is the perfect spot to hold cupcake holders, paper straws and cookie sticks! She is now in her forever home...waiting to be used. I love her! I love the color so much, I used it on another project for the room...which I will share next time! I love the transformation so much Kim! I love seeing you fill your home with things you have DIYed. It has to give you a warm feeling inside to know you did them. Looking forward to your next transformation. Thanks Boo! It is been a lot of fun, and a wonderful learning process...thank you so much for helping me along, offering suggestions and cheering me on...you are always so supportive! It never would occur to me that the table could be so adorable! Great job in having the creativity to envision it in a different way. I've never painted furniture, but you make me feel that I need something pink ;-) Great job Kimmie! Thanks Cristin! You soooo need pink furniture in your home...as a matter of fact...I have painted some furniture PINK...for my cookie/craft room...Hopefully, I will get a post up about it later this week. As I was painting, you were on my mind...I can not see pink...without thinking of you! Very cool! I never would have thought to make it a storage bucket! But.. I am a sewer so I'd have to put a vintage machine in there! I see old machines/table like this at the thrift store often, but know I could never rehab it as you have. And they aren't big enough for quilting so I couldn't put my machine in it...so I'd do the storage idea....Thanks for the cool thought. I followedy ou from Snickerdoodle linky! Thank you so much Cheri! I wish so much I was a sewer, but sadly, I am not! It does make a great little table and wonderful for storage. I can not put really heavy things in there, but it is perfect for cupcake liners and straws, which both have a way of multiplying! Have a great day, and thank you for stopping by! So cute! I have the sewing machine that fits in my grandma's old sewing table. I don't want to use the table for the machine but maybe they'll let me paint it...Pinning! Oh...you should paint it. Painting furniture has become a slight addition of mine. I have so many more project to share. Painting furniture is fun, I love doing it, but there are some times that it is best to leave them in their natural state, you know what I mean? I say to what is best for you, maybe start small, or with a piece that you have no sentimental attachment to. Have fun! 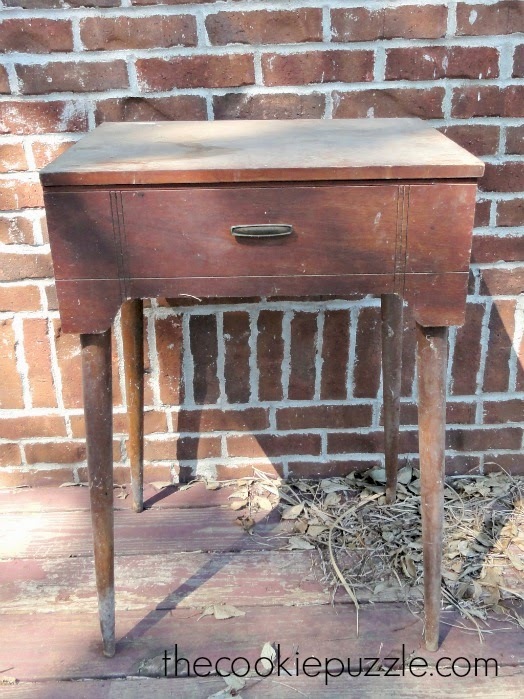 You did a wonderful job on this old Sewing table!! =) It looks great! Gorgeous color! Very fun retro vibe, much more fun than my mom's sewing desk. Maybe I can convince her to let me paint it? On second thought, I'd rather not take it from her because she owes me some monogramming, haha. This looks awesome. What an amazing transformation. And I love that color. I am completely addicted to this color...I have used it on another piece for the cookie/craft room, hopefully, I will get it posted later this week. Thank you Leesha. This was so much fun, and I just love how it turned out. My husband is getting tired of all the painting going on, but I figure it is MY room...I can do what I want! One more question: Somewhere on one of your pages, you said you were going to talk about a technique you used on your concrete (porch?). Have you done that? If so, where? Oopppsss...Sorry, Ange...I have not talked about that yet...you know how it is, life happens and things happen...and you totally forget about what you said you were going to do. I will try to get that posted soon. Thank you so much for following along this journey with us! Hey Ange! Adding the corn starch or plaster of Paris gives the paint some texture, giving you the ability to paint anything with out sanding or priming. It is a wonderful way to paint, it just covers so much better. As you can see, this table was a pretty dark wood, but I was able to get complete coverage in just two thin coats. I know it might seem like a silly step, or even unnecessary , but it really does help. You just gave me a great idea...maybe I should do a post comparing the two! I will see if I can find a small table, paint one half with regular paint, and the other with the DIY Chalk Paint. Great idea! Also, could you compare using wax vs varnish? I'm only familiar with waxing over chalk paint. Good idea. What brand of wax do you recommend? Hopefully something that I can get in retail stores. It's amazing! I love the color very much - it's like the sky! Great job! I've never used anything but homemade chalk paint...not only because I like an array of colors, but because I'm too cheap to buy the premade paint! The color you chose looks nice on this piece and it looks like it will be the perfect place for storing those baking necessities! Thanks for sharing with us! Thanks Jamie! This is the only recipe I have ever used...what do you use? Would you mind sharing with me. AND....I am totally like you, I am too cheap to buy the "high end" chalk paint. I have used some of the ones available in the craft stores...but only with a coupon! LOL! Kim, you are my hero! 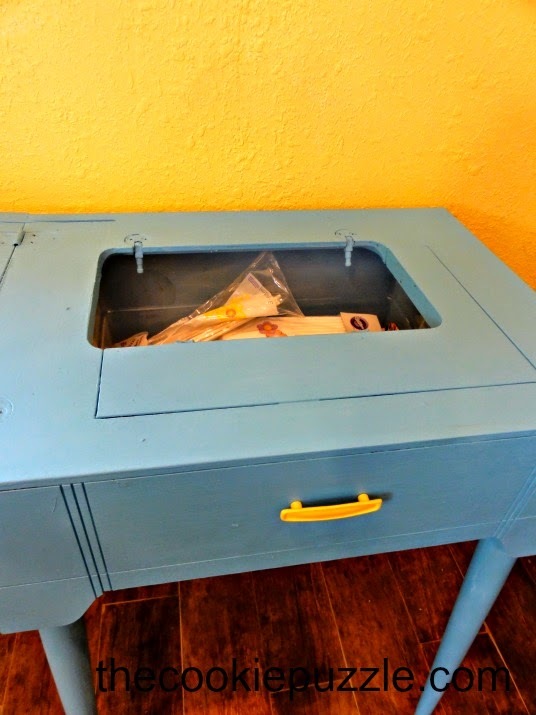 You are about the only other person I know (besides myself) that would turn a sewing table into a storage area simply because I can't sew a button on a shirt! This looks fabulous! FYI, I clicked the link for the DIY Chalkboard Paint and it took me to her homepage. I clicked around a bit and couldn't find it. Would love to know how she does it! Hook me up! Thanks for sharing with us at the Teach Me Tuesday Linky Party! Oh Adrian...I can sew a button on,...but that is about all I can sew! I got the link all fixed...it will now take you to the page where she shares her recipe...and because you are so dang sweet...I will tell you the secret ingredient.it is CORN STARCH! I love this stuff...but be careful...it is highly addictive...you will find yourself paining anything that will sit still! I love this! 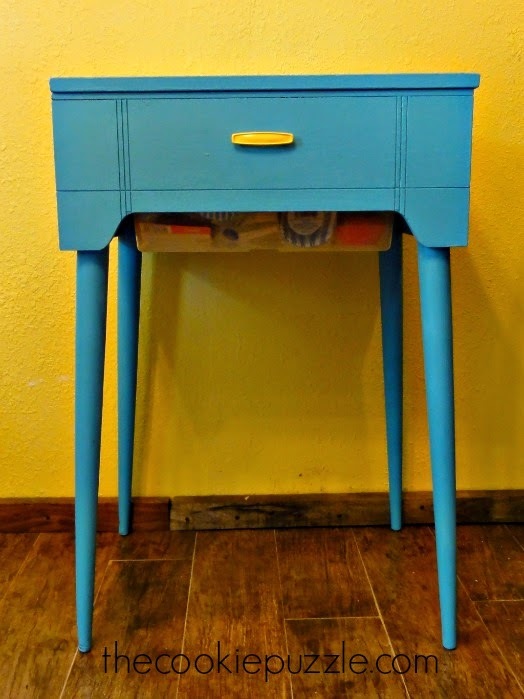 I have one that looks a LOT like this one in my garage that I have been wanting to redo! It was given to me by my great aunt and still has an old Kenmore sewing machine in it...wow! Thanks for the inspiration!